Offering you a complete choice of products which include bottling plant tanks and bottling storage tank. We are one of the leading names engaged in manufacturing, supplying and exporting a quality range of tanks for Bottling Plant Tanks. 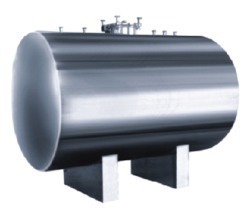 Our range of tanks is manufactured using high quality stainless steel and mild steel. Owing to this, our range exhibits features like durability and reliability. Clients can avail our range at industry leading price. We manufacture modern chillers for removing heat from liquids using a vapor-compression or absorption refrigeration cycle. These are manufactured from quality raw materials and components. Our chillers are offered in wide variety of power capacities and fabricated in application specific ways. Looking for “Bottling Plant Tanks”?